LONDON - Although a video review denied his side a statement victory over New Zealand, England's performance - and lack of fortune - left Eddie Jones full of optimism less than a year out from the Rugby World Cup. LONDON - New Zealand survived a late scare to hold on for a 16-15 comeback victory over England at Twickenham in their first matchup in four years on Saturday. England thought it secured a rare victory over the world champion when Sam Underhill touched down five minutes from fulltime, but video review revealed Courtney Lawes was offside when he made a chargedown to launch the move. 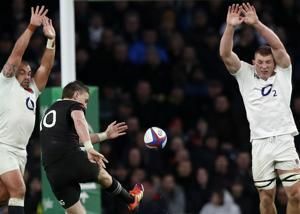 England made a dream start as Chris Ashton and co-captain Dylan Hartley scored tries either side of an Owen Farrell dropped goal for 15-0 after 24 minutes.